Manta Ray Bed and Breakfast has two large guestrooms available. The Queen Sized beds have mosquito netting and are Bali themed. Perfect for a romantic getaway and for honeymooning couples. The room rate is per room/per night. NB. When we let one room we do not let the other as we do not expect people who do not know each other to share a bathroom. The second room is available for families or friends prepared to share a bathroom with an extra discounted fee when booking both rooms. If booking one room, you would have a private bathroom as our policy is not to let the second room when just a couple book. 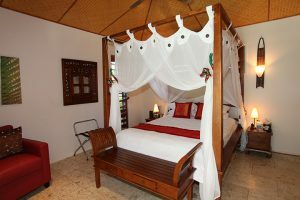 Manta Ray has been operating as a B & B for nearly fourteen years now accumulating hundreds of five star reviews for the quality of its hospitality, decor, breakfasts and ambiance. Room prices are per room per night and accommodate 2 people. Children up to 10 years can be accommodated in a pull out camp bed and a porta cot can be supplied for babies. If there are extra people or grown children, you will need to book two rooms. Please indicate in your enquiry if you would like one or two rooms. 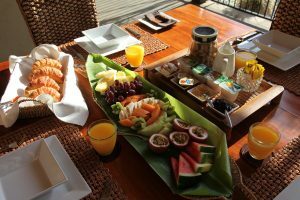 All rates include a substantial tropical style breakfast. 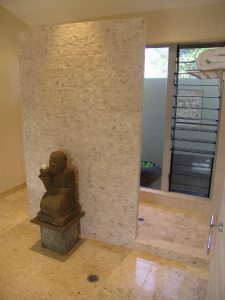 1 room- November to April is $130/night. Public holidays attract a 15% surcharge. 2 rooms – November to April is $240/night. Public holidays attract a 15% surcharge. 2 rooms – May to end October is $260/night. No Surcharge.